Terry Habeger paints with acrylics on sculptural clay forms, 3D and flat clay wall pieces, and on masonite and canvas. Someone once referred to his abstract pieces as 'Internal Landscapes' and Terry liked that characterization. It is the combination of painted geometric variations with form that continues to intrigue him. Habeger started as a potter, consequently the forms were the first to evolve. When Terry began painting with acrylics on the forms many things changed as he had the challenge of a new medium and unlimited color control. 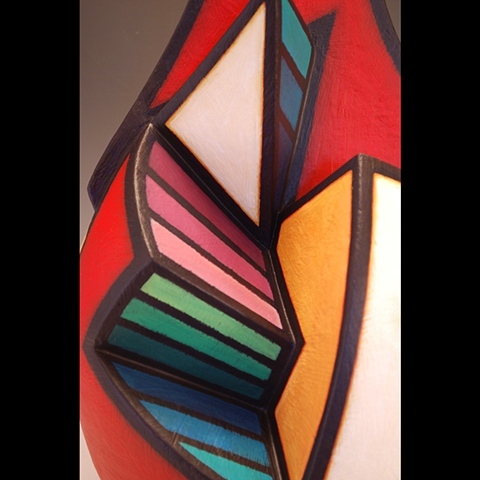 It is Habeger's love for the two mediums, clay and paint, that continues to excite and challenge him. The sculptural clay forms start on the potter's wheel. Part of the wheel-thrown form is cut away and clay slabs are added that both penetrate and extend beyond the original form. The piece is fired, primed and handpainted with acrylics. Habeger also constructs sculptural clay slab forms. These are typically hard-edged and geometric in nature. Terry's 3D wall pieces are contructed mostly from clay, but sometimes from masonite and foam core board as well. Habeger textures the clay, board and canvas surfaces with several coats of a professional-grade acrylic paste before he paints. All of the paintings are finished with a coat of matte medium, which results in a uniform, semi-flat finish. Terry uses Golden acrylic products.